Step 1.2: Coding the Manage Part-1 Understanding args array of Manage. Step 1.3 Coding the Manage Part-2 Filters and Search functionality of Manage. Step 1.5: Create “crud-single-contact-data” module in the Common Services. Step 1.6: Create “lead-block” module in the Common Services. This tutorial is about building Enterprise Manage from scratch with step by step instructions. Before diving into the specifics, left first understand Manage with its need and purpose. In our case, we are dealing with difficult things like handling large datasets (few million record sets) with the ability of CRUD operations on it. Make search operations blazing fast on these huge datasets or even creating & managing, custom & complex business workflows along with easy to use interface for all the stakeholders. And yes we do succeed to deal with these difficult things, by using “Manage” built on Awesome Enterprise. The need for managing complex business workflows (along with its huge dataset’s) drives the purpose of Enterprise Manage. One more thing, Enterprise Manage also solves another problem of handling these complex business process, all under a single umbrella with a unified and clutter-free interface to handle almost all things at one place instead of going back & forth between WordPress admin and frontend sections. This helps all the stakeholders to focus on what matters most important to them. Following is the list of dependencies for “Enterprise Manage.” Make sure that every dependency is met. MariaDB is an open source (RDBMS) which is a compatible drop-in replacement for the MySQL database. One of the main reason to use MariaDB is the support of Common Table Expression (CTE) using “WITH” keyword (CTE allows to refer to a subquery expression many times in a query as if having a temporary table that only exists for the duration of a query ). Redis is an open-source in-memory database project implementing a distributed, in-memory key-value store with optional durability. It can be used as a database, cache and message broker. To learn more about Redis, an excellent ebook “REDIS IN ACTION” is available for free which discusses Redis, right from its core concepts (data structure supported by Redis ) to more advanced concepts including a real-world example of how Redis helped to solve that specific problem. This App is responsible for registering styles and scripts used for specific look and feel of Enterprise Manage. This App is a “Starter Awesome Enterprise App” which is used to build our Enterprise Manage. Note: For details regarding Awesome Enterprise Apps, please visit this URL. “Awesome Enterprise Services” allows reuse of the business logic which is common across various Awesome Apps, other Services e.t.c. These services are imported into WordPress Installation using WordPress Importer (in XML format). Screenshot 1: Awesome Enterprise Services. Responsible for all DB related operations. Responsible for the rendering of form controls such as input type text, radio, select boxes e.t.c. Following modules from “Form control service”are used in the tutorial. Responsible for all rendering of UI blocks such as Menus, UI Cards e.t.c. Used for sending is notifications using Emails or SMS. Responsible for handling search functionality along with actions taken on the returned dataset, such as display data as datatable or export data into CSV format. Common Services has generic, site-specific code used in other Services, Apps e.t.c. Responsible for creating a view named as all_terms, so that WordPress tables wp_terms, wp_term_taxonomy, and wp_term_relationships tables are available as a single view to query. Code snippet 1: “all_terms” View. CPT named as “contact” with Name as post_title, Title, Mobile No., Email, Address, Designation as meta fields, County, City, Industry as taxonomies. Let’s first have a glimpse of how “Enterprise Manage” looks. Manage view can logically be divided into various sections, as shown in above screenshot 1. Top menu: This is where we define menu items. Note: Besides the above options, filters and search on custom table or even a custom SQL filter query is supported by Enterprise Manage. Handlers: In what format the data is to be Handled is defined by Handlers or a better way to explain it is what to do with the filtered data, display it, export it e.t.c. Filtered Data: Filtered Data displayed in Tabular format. Until now we had a view of how “Enterprise Manage” looks, now let’s build it step by step. The best way to learn something new, (especially in the world of programming ) is to take a real-world example and use it as a vehicle for learning. So for this tutorial, Let’s say we want to “Manage List of Contacts.” The “Manage” should be able to handle operations such as Edit, Update, Search and filter e.t.c. on the list of Contacts. To store the data of contacts we are using a CPT named as “contact.” For simplicity purposes, we are assuming there is data available for us to manage (around 50 Contacts). For registering CPT, we are using CPT UI, and for handling CPT’s meta, we are using ACF which are third-party plugins. So it is left to the reader to create the required custom post type, its meta, and taxonomies. Note: For this tutorial purposes we are considering few Contacts fields as our focus is on learning how to build Enterprise Manage. Although we have a limited number of contacts fields, they are sufficient enough to explain how to build an Enterprise Manage and understand its working. Code snippet 2: “manage” module in Contact App. The first section (generally) is a “after submit” using [after_submit] shortcode, which defines a “with” query ( Basically MariaDB’s Common Table Expression [CTE] referenced later in subqueries ) using [with ] shortcode inside a [query] shortcode and which is the “main query” for required resultset. Inside [with] shortcode, all Contacts with post status as published is queried. Following sub-code snippet, 2-1 depicts this. Sub-Code snippet 2-1: “published_posts” of post_type “contact” main query. Next, we use [filter] shortcode(s) to filter data on post meta title and all terms of taxonomies contact_city, contact_county, and contact_industry. Exact & Generic search operations are available to search through contact data. These operations looks for data for searched keyword in Mobile no., Email, address and designation field of Contacts. If required we can use the shortcode [add_field], if we want to order or group the selected data. Following sub-code snippet, 2-2 depicts this. Sub-Code snippet 2-2: Filters applied to main “With” query. Next, we transform/ transpose the data from row-based format to column-based format to display it in a tabular format. Following sub-code snippet, 2-3 depicts this. Sub Code snippet 2-3: transform / transpose data returned from “With” query. The next step is to specify columns required for fetching data, displayed in a tabular structure (as shown in screenshot 2). Sub-Code snippet 2-4: Fetch contact data. We are fetching data using [meta_keys] and [ taxonomies] shortcodes, and inside [meta] shortcode, as seen in the above sub-code snippet 2-4. Note: The query built for fetching data (such post meta, taxonomies, or even for data from the custom table ) has the following format. The final part of “After submit” section is [table] shortcode, is as depicted in sub-code snippet 2-5. Sub-Code snippet 2-5: Display contact data. [column] shortcode inside the [table] shortcode, the maps the [meta_keys] and [taxonomy] shortcode inside [meta] shortcode (as seen in sub-code snippet 2-5) and displays the data in a tabular format (thanks [transform] / [transpose] shortcode). Sections which are to be displayed for filtering data are listed here. Following sub-code snippet, 2-6 depicts this. Sub-Code snippet 2-6: Filters Section. Sub-Code snippet 2-7: Handlers section. Display specific no. of records quickly (In our case 100 set by max_count shortcode parameter of the fasttable) . Export data as CSV or Excel. Display charts and graphs of the filtered data. The concludes the discussion sections of the args array. Next step is to consume this array for displaying search and filters, handling its form submission and viewing data based on it. args array is passed as an argument to the main template of search module of Common Services, in the manage module of the Contact app. Also, auto_handler (required) parameter of the main template is set to fasttable. Sub-Code snippet 2-8: “args” array & “auto_handler” parameter passed to “search_filters” module. Next, create “search_filters” module under Common Services and copy paste following code snippet inside it. Template to Render filter fields in section. Code snippet 3: “search_filters” module of Common Services. The main functionality of search_filters module is to build the HTML view of filters such as title, city industry and county (as seen in screenshot 1) with its form submit actions such as fasttable, csv (download CSV) e.t.c. To understand search_filters module (above code snippet 3), let’s divide it into sections so that we can digest it one at a time. 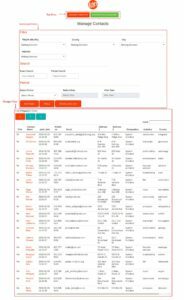 This is the first section before the main template, defining variables for drop down options of Title, City, County, and Industry select boxes. Variable declared outside any template of the module, can be accessed in all the templates making them global with respect to the current module. Sub-Code snippet 3-1:”Global module variables” section of “search_filters” module of Common Services. The main template is called from manage module of the Contact App as depicted at last line of code snippet 2. Second section : Main template which displays the Search and filters section and bind events to its respective actions buttons. Sub Code snippet 3-2:”Main” template which displays Search and filters along with its action options. The first thing we do in the Main template is to create a ticket from Search Services. Ticket generation is a concept used for form submission. It generates a masked URL, to which the form data is to be submitted by AJAX. Pro Tip: To directly call Services on a button click, Tickets are used. Sub-Code snippet 3-3: Generate masked URL for Form submissions. The next thing we do is that we render the filter section (as depicted screenshot 1). We loop through sections set in the main args array and render individual filters using Form Control Services. Inside the loop two templates render_filter_sections (to render sections) inside which render_filter_fields (to render individual filter field) are called. Sub-Code snippet 3-4: Loop to display Search and Filters sections. Form Controls Service handles the logic for building the HTML of the filter fields of types such as date, text and select e.t.c. Next, in the search_filters main template, submit action of Form (with id as search_form) is bound to the button of class “js-submit-job.” Also, the form attribute route_ajax is set to ticket created by a new_ticket. Sub-Code snippet 3-5: Bind Form submit action to a button and specify its route_ajax. Once the form is bound, “handler-scripts” module of Search Services creates buttons (defined in [handlers] section of main args array) and bind its click event of various handlers such as fasttable, table e.t.c. Sub-Code snippet 3-6: “auto_handler” parameter of “handler-scripts” search service. “handler-scripts” module is also responsible for auto submit of the search form for the first time on page load using the autohandler parameter of search_filters module of Common Services. This concludes the Building the Manage view section of this tutorial and we achieve the functionality as depicted in the screenshot 1. Let’s first have a glimpse of how the Single view of Enterprise Manage looks. Screenshot 3: Single View of Manage. The “Single view of Manage” is for viewing a single Contact data along with the functionality to Edit and Update it. Screenshot 3 depicts this. Step 1.4: Create “single” module in the Contacts app. Code snippet 4: “single” module in the Contacts app. As seen from the above code snippet, we get the query string parameter of the zeroth index qs.0 (which is basically, the post id of Contact CPT that we want to edit) set into single_data environment variable. This variable is then used by the “editable_personal_details” template of lead-block module and display module of Single services. Create a module in the Common Services named as “crud-single-contact-data” and paste in following code snippet. Code snippet 5: “crud-single-contact-data” module of Common Services. crud-single-contact-data module’s template “get_contact_data” gives sets the Contact data in an environment variable called single_data.contact_data to view & edit it. 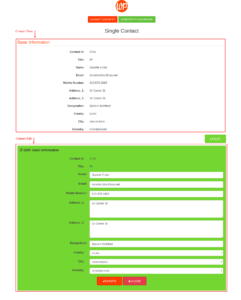 Further, this module also has a template which handles the update logic, when the edit form of Contact is submitted. Step 1.6: Create a module named lead-block in the Common Services. Code snippet 6: “lead-block” module of Common Services. As seen from above snippet, first we create an array named as single_data.blocks as an environment variable, containing a list of shortcodes, which handles the logic required for viewing, editing and updating Contact details. Single view of contact is achieved by [action] shortcode as seen in sub -code snippet 6-1. This shortcode uses [ atts ] shortcode to create a section called “Basic Information” on the single view of manage (as seen in screenshot 3 ). [atts] shortcode accepts two arguments contact_post_id and meta_data. these arguments receive parameters from the single_data environment variable. Sub-Code snippet 6-1: [atts] and [action] shortcodes in the lead-block module. Lastly, edit form of Contact is created using [field] shortcodes with [edit_service] responsible for displaying the form and [update_service] shortcode responsible for updating the Contact data after edit form submit. Below sub-code, snippet 6-2 depicts this. Sub-Code snippet 6-2: Single Contact Edit and Update options in the “lead-block” module of Common Services. That’s it for the Single view of Manage screen. We are now able to View, Edit and Update a Single Contact. To explain each & every concept along with its working in one tutorial is impossible. Definitely, in the near future, more documentation, explanation of core concepts, more supporting tutorials of Enterprise Manage will be planned.